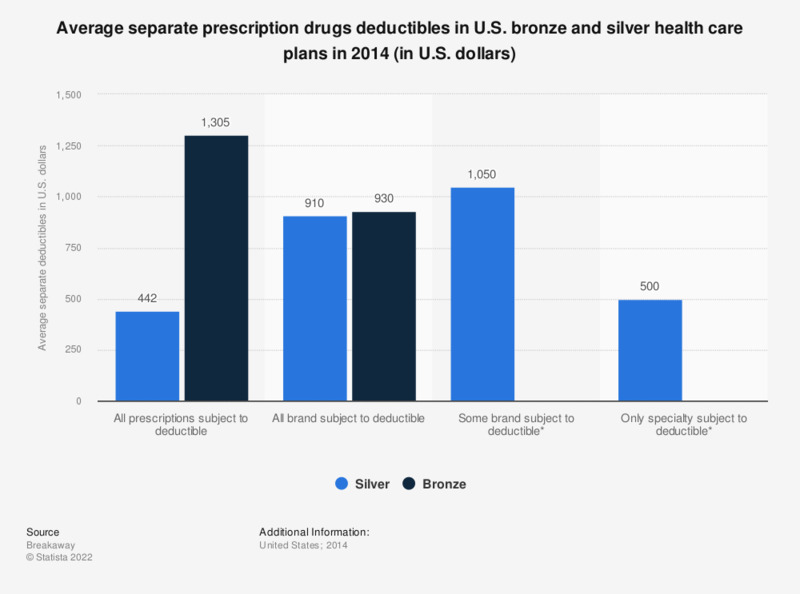 This statistic displays the average separate prescribed drugs deductibles for bronze and silver health care plans in the United States as of 2014. The average separate deductible for a silver plan where all prescriptions are subject to deductible was 442 U.S. dollars. A deductible is set as the amount one must pay for covered medical services before the insurance begins paying. This cost sharing analysis is based on a review of the 1,204 unique Silver and 1,056 unique Bronze qualified health plans in all 50 states’ and the District of Columbia’s insurance Exchanges. The premium analysis is based on a review of 7,011 Silver plans and 5,869 Bronze plans in all 50 states’ and the District of Columbia’s insurance exchanges. It was prepared for PhRMA and its member companies based on data available through state and federal government-sponsored exchange websites as of 1/1/2014.